Read Google Reviews by customers of a Mailbox Company that provides Naperville Residents with mailbox installation service. The Mailbox Company is a local business named Mailbox Remedies. 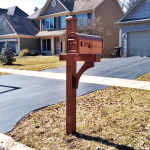 Mailbox Remedies provides mailbox installation for Naperville, Wheaton, Aurora, Plainfield, Bolingbrook, Romeoville, Joliet, New Lenox, Lockport, Frankfort, Homer Glen, Orland Park and Tinley Park (Just to name a few). Mailbox Remedies has become known as a One Stop, Mailbox Shop. This means you can visit the Mailbox Remedies Website, shop for mailboxes, mailbox posts and set up your mailbox installation service without ever leaving the comfort of your home. What are the Customers saying on Google? Mary Beyer says “Jeremy came out to install my new mailbox and post, even though I’m out of the service area. He did an awesome job! He’s very friendly, courteous, and knowledgeable. He really took the time to make sure everything was installed perfectly. He even fixed the spot where the old mailbox used to be. I highly recommend Mailbox Remedies! Howard Smoyer says “My mailbox jumped out into the driveway and got smacked by the car. Oooops …. I’ve repaired them myself, but they seem to turn out to be a wobbly mess, tilting towards the road, and only to bend or break at the first big snowstorm when the plow comes by..
Ready to schedule your mailbox installation?